Absolute Surrender | Victory - Honor God. Make Disciples. 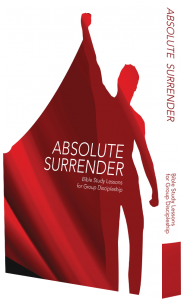 Absolute Surrender is a collection of six booklets for group discipleship designed to help disciples follow God together. Each booklet consists of six lessons, each with their own Connect, Word, and Prayer discussion guides and questions. To download a PDF onto your desktop computer or laptop, please choose a booklet title, right-click on the PDF link, select Save As (PC)/Save Link As (Mac), then save the PDF into your computer. Read using any PDF reader of your choice. To download an iBook onto your desktop, please choose a booklet title, right-click on the PDF link, select Save As (PC)/Save Link As (Mac), then save the iBook file into your computer. Open your iTunes, then drag the .iBook file to the iTunes window. Select the iOS device in the Devices section of the iTunes Sidebar. Go to the Books pane. If it’s not already selected, select the Sync Books option. Select the All Books option. Sync iTunes to your iOS device. To download a PDF onto your Android device, please choose a booklet title and hold down on the PDF link until a menu pops up. Select Save Link, choose a location, then save the PDF into your computer. Read using any PDF reader of your choice. To download a PDF onto your iPhone, please ensure first that you have a PDF reader. Once you have one, hold down on the PDF link until a menu pops up. Select Copy. Then proceed to your PDF reader, find the option that reads “Download PDF,” “Enter URL” or “Add PDF,” and tap the URL box twice to paste the address of your PDF. Click the “OK” or “Download” button to send the PDF file to your phone. Access the “Saved Files” feature on your app to view your PDF. To download a PDF onto your iPad, tap once on the PDF link to display a bar at the top of the screen. Select Open in iBooks. The PDF file will appear on a shelf in iBooks. Tap the file to open it.